As with the Gothic architecture of other parts of Europe, English Gothic is defined by its pointed arches, vaulted roofs, buttresses, large windows, and spires. The Gothic style was introduced from France, where the various elements had first been used together within a single building at the choir of the Basilique Saint-Denis north of Paris, built by the Abbot Suger and dedicated on 11 June 1144. The earliest large-scale applications of Gothic architecture in England are at Canterbury Cathedral and Westminster Abbey. Many features of Gothic architecture had evolved naturally from Romanesque architecture (often known in England as Norman architecture). This evolution can be seen most particularly at the Norman Durham Cathedral, which has the earliest pointed ribbed high vault known. English Gothic was to develop along lines that sometimes paralleled and sometimes diverged from those of continental Europe. Historians traditionally divide English Gothic into a number of different periods, which may be further subdivided to accurately define different styles. Gothic architecture continued to flourish in England for a hundred years after the precepts of Renaissance architecture were formalised in Florence in the early 15th century. The Gothic style gave way to the Renaissance in the later 16th and 17th centuries, but was revived in the late 18th century as an academic style and had great popularity as Gothic Revival architecture throughout the 19th century. Many of the largest and finest works of English architecture, notably the medieval cathedrals of England, are largely built in the Gothic style. So also are castles, palaces, great houses, universities, and many smaller unpretentious secular buildings, including almshouses and trade halls. Another important group of Gothic buildings in England are the parish churches, which, like the medieval cathedrals, are often of earlier, Norman foundation. The designation of styles in English Gothic architecture follow conventional labels given them by the antiquary Thomas Rickman, who coined the terms in his Attempt to Discriminate the Style of Architecture in England (1812–15). Historians sometimes refer to the styles as "periods", e.g. "Perpendicular period" in much the same way as an historical era may be referred to as the "Tudor period". The various styles are seen at their most fully developed in the cathedrals, abbey churches and collegiate buildings. It is, however, a distinctive characteristic of the cathedrals of England that all but one of them, Salisbury Cathedral, show great stylistic diversity and have building dates that typically range over 400 years. The Early English Period of English Gothic lasted from the late 12th century until midway through the 13th century, according to most modern scholars, such as Nikolaus Pevsner. According to the originator of the term in 1817, Thomas Rickman, the period ran from 1189 to 1307; Rickman based his defining dates on the reigns of certain English monarchs. In the late 12th century, the Early English Gothic style superseded the Romanesque or Norman style (as it is better known in England, through its association with the Norman Conquest). During the late 13th century, it developed into the Decorated Gothic style, which lasted until the mid-14th century. With all of these early architectural styles, there is a gradual overlap between the periods. As fashions changed, new elements were often used alongside older ones, especially in large buildings such as churches and cathedrals, which were constructed (and added to) over long periods of time. It is customary, therefore, to recognise a transitional phase between the Romanesque and Early English periods from the middle of the 12th century. Although usually known as Early English, this new Gothic style had originated in the area around Paris before spreading to England. There it was first known as "the French style". It was first used in the choir or "quire" of the abbey church of St Denis, dedicated in June 1144. Even before that, some features had been included in Durham Cathedral, showing a combination of Romanesque and proto-Gothic styles. By 1175, with the completion of the Choir at Canterbury Cathedral by William of Sens, the style was firmly established in England. The most significant and characteristic development of the Early English period was the pointed arch known as the lancet. Pointed arches were used almost universally, not only in arches of wide span such as those of the nave arcade, but also for doorways and lancet windows. Romanesque builders generally used round arches, although they had very occasionally employed slightly pointed ones, notably at Durham Cathedral, where they are used for structural purposes in the Nave aisles. Compared with the rounded Romanesque style, the pointed arch of the Early English Gothic looks more refined; more importantly, it is more efficient at distributing the weight of the stonework above it, making it possible to span higher and wider gaps using narrower columns. It also allows for much greater variation in proportions, whereas the strength of round arches depends on semicircular form. Through the use of the pointed arch, architects could design less massive walls and provide larger window openings that were grouped more closely together, so they could achieve a more open, airy and graceful building. The high walls and vaulted stone roofs were often supported by flying buttresses: half arches which transmit the outward thrust of the superstructure to supports or buttresses, often visible on the exterior of the building. The barrel vaults and groin vaults characteristic of Romanesque building were replaced by rib vaults, which made possible a wider range of proportions between height, width and length. The arched windows are usually narrow by comparison to their height and are without tracery. For this reason Early English Gothic is sometimes known as the Lancet style. Although arches of equilateral proportion are most often employed, lancet arches of very acute proportions are frequently found and are highly characteristic of the style. A notable example of steeply pointed lancets being used structurally is the apsidal arcade of Westminster Abbey. The Lancet openings of windows and decorative arcading are often grouped in twos or threes. This characteristic is seen throughout Salisbury Cathedral, where groups of two lancet windows line the nave and groups of three line the clerestory. At York Minster the north transept has a cluster of five lancet windows known as the Five Sisters; each is 50 feet tall and still retains ancient glass. Instead of being massive, solid pillars, the columns were often composed of clusters of slender, detached shafts (often made of dark, polished Purbeck "marble") surrounding a central pillar, or pier, to which they are attached by circular moulded shaft-rings. Characteristic of Early Gothic in England is the great depth given to the hollows of the mouldings with alternating fillets and rolls, by the decoration of the hollows with the dog-tooth ornament and by the circular abaci of the capitals. The arches of decorative wall arcades and galleries are sometimes cusped. Circles with trefoils, quatrefoils, etc., are introduced into the tracery of galleries and large rose windows in the transept or nave, as at Lincoln Cathedral (1220). The conventional foliage decorating the capitals is of great beauty and variety, and extends to spandrels, roof bosses, etc. In the spandrels of the arches of the nave, transept or choir arcades, diaper work is occasionally found, as in the transept of Westminster Abbey, which is one of the best examples of the period. At its purest the style was simple and austere, emphasising the height of the building, as if aspiring heavenward. Early English architecture is typical of many Cistercian abbeys (both in Britain and France), such as Whitby Abbey and Rievaulx Abbey in Yorkshire. Salisbury Cathedral is a superb example of the style; because it was built over a relatively short period (the main body between 1220 and 1258), it is relatively unmixed with other styles (except for its façade and famous tower and spire, which date from the 14th century). Other good examples are the Galilee porch at Ely Cathedral; the nave and transept of Wells Cathedral (1225–40); the west front of Peterborough Cathedral; and Beverley Minster and the south transept at York. The style has also been used in academic buildings, such as the old library of Merton College, Oxford, which constitutes a portion of the so-called "Mob Quad." The Decorated Period in architecture (also known as the Decorated Gothic, or simply "Decorated") is a name given specifically to a division of English Gothic architecture. Traditionally, this period is broken into two periods: the "Geometric" style (1250–90) and the "Curvilinear" style (1290–1350). Decorated architecture is characterised by its window tracery. Elaborate windows are subdivided by closely spaced parallel mullions (vertical bars of stone), usually up to the level at which the arched top of the window begins. The mullions then branch out and cross, intersecting to fill the top part of the window with a mesh of elaborate patterns called tracery, typically including trefoils and quatrefoils. The style was geometrical at first and flowing in the later period, owing to the omission of the circles in the window tracery. This flowing or flamboyant tracery was introduced in the first quarter of the 14th century and lasted about fifty years. This evolution of decorated tracery is often used to subdivide the period into an earlier "Geometric" and later "Curvilinear" period. Interiors of this period often feature tall columns of more slender and elegant form than in previous periods. Vaulting became more elaborate, with the use of increasing number of ribs, initially for structural and then aesthetic reasons. Arches are generally equilateral, and the mouldings bolder than in the Early English Period, with less depth in the hollows and with the fillet (a narrow flat band) largely used. The ballflower and a four-leaved flower motif take the place of the earlier dog-tooth. The foliage in the capitals is less conventional than in Early English and more flowing, and the diaper patterns in walls are more varied. Examples of the Decorated style can be found in many British churches and cathedrals. Principal examples are those of the east ends of Lincoln Cathedral and of Carlisle Cathedral and the west fronts of York Minster and Lichfield Cathedral. Much of Exeter Cathedral is built in this style, as is the crossing of Ely Cathedral, (including the famous octagonal lantern, built between 1322 and 1328 to replace the fallen central tower), three west bays of the choir and the Lady Chapel. In Scotland, Melrose Abbey was a noteworthy example, though much of it is now in ruins. The interior of Gloucester Cathedral conveys an impression of a "cage" of stone and glass, typical of Perpendicular architecture. Elaborate Decorated style tracery is no longer evident, and the lines on both walls and windows have become sharper and less flamboyant. The Perpendicular Gothic period (or simply Perpendicular) is the third historical division of English Gothic architecture, and is so-called because it is characterised by an emphasis on vertical lines. An alternative name, the Rectilinear, was suggested by Edmund Sharpe, and is preferred by some as more accurate, but has never gained widespread use. The best example of Perpendicular Gothic architecture can be found in the vertical theatricality of Kings College Chapel, Cambridge. The Perpendicular style began to emerge c. 1350. Harvey (1978) puts the earliest example of a fully formed Perpendicular style at the chapter house of Old St Paul's Cathedral, built by William Ramsey in 1332. It developed from the Decorated style of the late 13th century and early 14th century, and lasted into the mid-16th century. It began under the royal architects William Ramsey and John Sponlee, and fully developed in the prolific works of Henry Yevele and William Wynford. In the later examples of the Decorated Period the omission of the circles in the tracery of windows had led to the employment of curves of double curvature which developed on the continent into Flamboyant tracery: the introduction of the perpendicular lines was a reaction in the contrary direction. The style can first be observed in the choir of Gloucester cathedral (1335) but its development is often assigned to the period after the Black Death which killed about a third of England's population in 18 months between June 1348 and December 1349 and returned in 1361–62 to kill another fifth. This had a great effect on the arts and culture, which took a decidedly morbid and pessimistic direction. This perpendicular linearity is particularly obvious in the design of windows, which became very large, sometimes of immense size, with slimmer stone mullions than in earlier periods, allowing greater scope for stained glass craftsmen. The mullions of the windows are carried vertically up into the arch moulding of the windows, and the upper portion is subdivided by additional mullions (supermullions) and transoms, forming rectangular compartments, known as panel tracery. Buttresses and wall surfaces are likewise divided up into vertical panels. The technological development and artistic elaboration of the vault reached its pinnacle, producing intricate multipartite lierne vaults and culminating in the fan vault. Doorways are frequently enclosed within a square head over the arch mouldings, the spandrels being filled with quatrefoils or tracery. Pointed arches were still used throughout the period, but ogee and four-centred Tudor arches were also introduced. Inside the church the triforium disappears, or its place is filled with panelling, and greater importance is given to the clerestory windows, which are often the finest features in the churches of this period. The mouldings are flatter than those of the earlier periods, and one of the chief characteristics is the introduction of large elliptical hollows. Some of the finest features of this period are the magnificent timber roofs; hammerbeam roofs, such as those of Westminster Hall (1395), Christ Church, Oxford, Trinity College, Cambridge, and Crosby Hall, appeared for the first time. In areas of Southern England using flint architecture, elaborate flushwork decoration in flint and ashlar was used, especially in the wool churches of East Anglia. 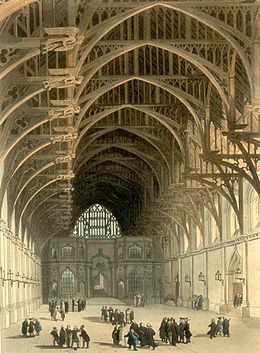 Some of the earliest examples of the Perpendicular Period, dating from 1335, are found at Gloucester Cathedral, where the masons of the cathedral seemed to be far in advance of those in other towns; the fan-vaulting in the cloisters is particularly fine. Perpendicular additions and repairs can be found in smaller churches and chapels throughout England, of a common level of technical ability which lack the decoration of earlier stonemasonry at their sites, so can be used for school field trips seeking evidence of the social effects of the plagues. Notable later examples include Bath Abbey (c. 1501 – c. 1537, although heavily restored in the 1860s), Henry VII's Lady Chapel at Westminster Abbey (1503–1519), and the towers at St Giles' Church, Wrexham, and St Mary Magdalene, Taunton (1503–1508). The Perpendicular style was less often used in the Gothic Revival than the Decorated style, but major examples include the rebuilt Palace of Westminster (i.e. the Houses of Parliament), Bristol University's Wills Memorial Building (1915–25), and St. Andrew's Cathedral, Sydney. ^ Sharpe, Edmund (1871). The Seven Periods of English Architecture Defined and Illustrated. ^ Frankl, Paul (2000). Gothic Architecture. Yale: Yale University Press. p. 193. ^ a b Harvey, John (1978). The Perpendicular Style. Batsford. This article incorporates text from a publication now in the public domain: Chisholm, Hugh, ed. (1911). "Decorated Period" . Encyclopædia Britannica. 7 (11th ed.). Cambridge University Press. p. 915. This page was last edited on 1 April 2019, at 06:39 (UTC).